Elegant hand-made thinner scissor with hollow-ground, titanium-coated stainless steel blades. The Haito Kizamu Thinner makes short work of thinning your clients' hair thanks to its convex cutting edge and titanium-coated stainless steel blades. It features an embellished and attractive hand-adjust screw system with a built-in ball-bearing and also makes a point of comfort—reducing stress on the hand, wrist, arm, shoulder and back thanks to its elegantly-designed crane offset handle and curved thumb. The Kizamu Thinner has 30 teeth and is finished with a titan purple rainbow effect, rhinestone-embellished screw and engraved handles. Its attractive looks are matched by its robust convex cutting edge. Available in 5.5 inches, with a free purple quilted scissor wallet. £51.00 (inc. VAT) Why no VAT? We're a trade wholesaler and quote our prices without VAT to help our VAT-registered customers understand the true cost of a purchase. 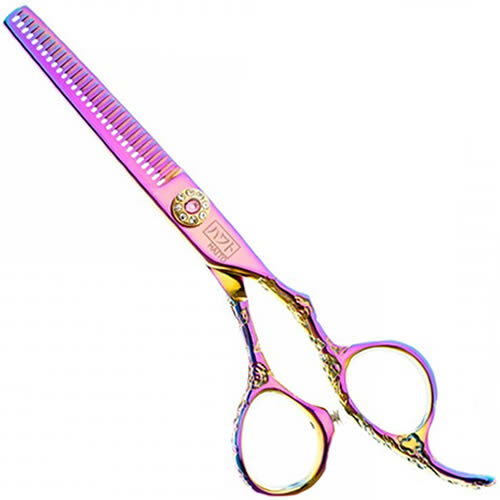 Elegant handmade scissor with hollow-ground, titanium-coated stainless steel blades, rhinestone-embellished screw and engraved handles. Available in 5 or 5.5 inches with a free purple quilted scissor wallet.